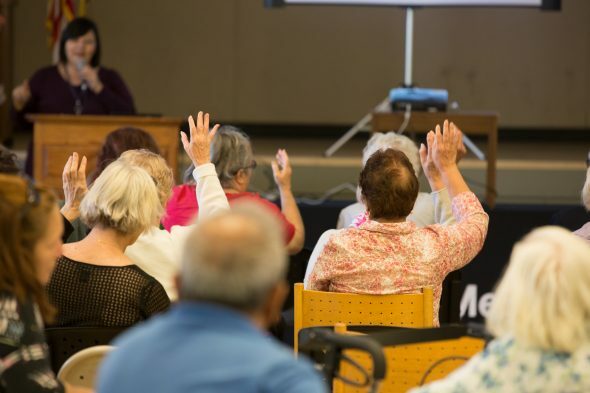 Metro’s On the Move Riders Program is hosting an Older Adult Transportation Pop-Up on Wednesday, May 23, from noon to 2 p.m. at the West Hollywood Council Chambers. The event is designed to provide older adults with information and resources to learn how to safely and independently travel on fixed route transportation. An informational presentation is slated to begin promptly at noon with attendees to learn about the benefits of riding transit, fun destinations, safety tips and more. Metro’s Mobile Customer Care Center will be on site during this time to process Senior Reduced Fare TAP Card applications free of charge. Persons 62 and up must present valid ID to apply. There will also be representatives the LIFE Program, ACCESS Services, LADOT and more. Come take advantage of the resources and information that will be provided at this special event. To plan your trip, use the Trip Planner at metro.net or call 323.GO.METRO. The event is accessible by Metro Bus or Rail, and can also be accessed by West Hollywood City Line.